Tip: When making a selection look at the bottom left of the workspace. There is a constantly updating readout showing the size of our selection. If you have managed to stick with me, thank you... if you need further help or clarification, please contact me, either directly through my contact page or via flickr mail - I am happy to try to help. As I started out saying, this is just one of many ways, what’s most important is to find a way that suits your method of working and become proficient and ... HAVE FUN!!! This method of masking images will work with PhotoPlus 10 onwards (it will also work with earlier versions that use layers and masks). 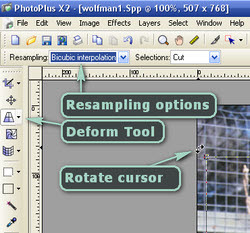 We could discuss the merits of various methods, all touched on in the PhotoPlus user manual (IMHO the ‘background eraser’ is best left well alone as it is a destructive process - DO NOT USE on your original image, only on a copy if you must use this tool at all!!! ), however, using Layer Masks is a long standing, reasonably quick, non-destructive method of digital image manipulation, capable of very fine, soft edges that help one image to blend almost seamlessly into another. It is very versatile and easy to pick up - my 13 year old daughter used this method for some art collage homework recently! The title of this tutorial, Simple Layer Masking, refers to the name for applying a mask to a layer, it is an action carried out on an image within this layer, much the same as we would remove red-eye from an image on a layer. It is the process of painting a mask (masking or screening) to hide an area of an image, enabling the image to be superimposed over another image or background, or softening the edges of an image without destroying pixels. With several ‘Layers’, each containing ‘Masked’ images, a new single image can be built up. Imagine a photograph of every member in a family aged 21, impossible to create it in one sitting but, with Layer Masking, each person, on their own layer, with their respective backgrounds painted out with a mask, the family portrait with every member aged 21 is possible. The layers can be merged into a single layer if wanted when we’re happy with the end result (personally I would keep the image as separate layers and save the merged image under a new name). Layer Masking is another term for ‘Extracting’ an image from a background (although the Extract tool in PhotoPlus does delete the background - and is not what we do with masking). The historical name is Mask, a photographer would ‘Mask’ out an unwanted area or fade out the background of an image during processing and printing by using something to prevent exposing a given image area to light for a certain length of time. This is one method of creatively working with images; most importantly, find ways that suit your method of working. Now you see him, now you don’t... you see him instead! We have not destroyed the masked image; the rest is just hidden (masked) from view. 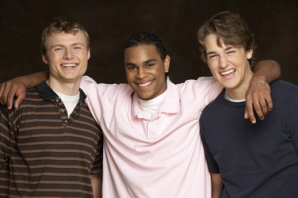 The original image depicted three men. Clicking on the link icon between the image and the mask allows us to move both the mask and image underneath independently. Notice the red cross on the link icon? This denotes that the image and its mask are unlinked. Simply by unlinking the mask, selecting and moving the image, our 'wolfman' can change identity instantly! We have not had to go through the entire process again to achieve this. On the far right screen-shot, the mask required a slight adjustment (hardly noticeable here), there’s more about this in the Simple Layer Masking Part Two. With our two chosen photos open in PhotoPlus, select our photo of the person. Using either the menu bar (Select>Select All), or keyboard (Ctrl+A), copy our image to the clipboard (menu bar = Edit>Copy; keyboard = Ctrl+C). 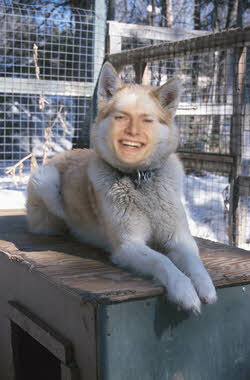 Open the other image, in this example the wolf, and paste the person as a new layer by going to ‘Edit>Paste as New Layer’ or with the keyboard short-cut ‘Ctrl+L’. It is important to paste our image as a new layer. Give this new layer a relevant name - the person’s name? ), the example is given the title ‘person’; from now on it will be referred to as such within the tutorial. To change the Layer name, double click on Layer1 in the Layers tab or right click and select Properties. Our original ‘Person’ image can now safely be closed as we have a copy on the new layer - this is what we will be working with from now on. Save the image under a new name to prevent overwriting your background image using the Save As command. There will be a warning pop up that explains it should be saved in the spp format - save it in the spp format, as this enables layers and effects to be saved within the file. What we have accomplished in this step is placing our person image onto a new layer of our backdrop image. The new layer partly or wholly covers the backdrop image, that’s okay; we will be attending to this later. With our person layer selected, reduce the opacity of this layer so that we can still see our person’s features, but also that of our backdrop through this top layer (for this example the opacity was reduced to 60%). Move the person roughly into position using the ‘Move tool’ to slide the image around. It is quite likely the two images will be different sizes and possibly at a slightly different slant, as in the example, this is easily rectified. Click on the Deform tool, the toolbar will change to display the options available with this tool. Select ‘Bi-cubic interpolation’ and leave the default as ‘Cut’. Selecting one of the corner nodes, hold down the Shift key to constrain the proportions of our person image and drag to resize (holding down the left mouse button as we drag), so that the features are in the right place. It is important to constrain the proportions to keep the person recognisable when we add the mask. To rotate the image using the Deform Tool, move the mouse over one of the corners (just to the outside edges) until the cursor changed to a curved, double headed arrow. Holding down the left mouse button, drag in the desired direction. Tip: The eye icon at the side of the person layer can be clicked off and on to help with positioning. 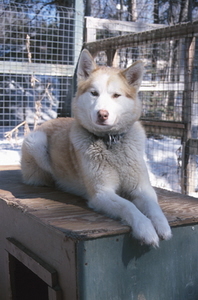 For the example image, the eyes of both the wolf and person were lined up. 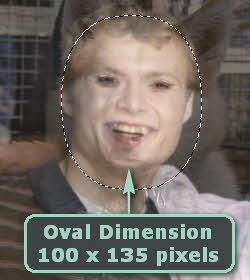 The men layer rotated slightly to line up the run of the face from the eyes, through the nose to the mouth. A word on aesthetics. Always make any changes to images by constraining the proportions. Stretched images in either direction look bad (read amateurish). If the image is too small in either direction, make it fill the area and try a crop instead. There’s seldom a good reason to be given for stretched images unless we’re making a caricature. No professional image editor will mutilate there images in such a way, why should we? Time to save our progress - press Ctrl+S. Leaving our person layer semi-transparent, click on the Rectangle Selection Tool. Notice the ‘Context toolbar’ open? It is just above the workspace with our image. From left to right it has four different selection options whose titles pop up as we run our mouse over them. We are interested in the next two boxes, one called Feather, the other a tick box with the word Anti-Alias next to it. Feather: this refers to the amount a selection softens from opaque to transparent; the number entered here is the number of pixels this will affect. Anti-Alias: this refers to the smoothing of edge pixels. Checked, it blends the edge pixels with those of the background to give a smooth edge, unchecked it doesn’t smooth and leaves a hard edge. Check the Anti-Alias box. Now for the feather setting; we’ll play with it for a moment. Set it at 0 and make a selection using the Rectangle Selection Tool (left click the mouse and , while still holding the button down, drag it partway across the image), it doesn’t matter where. Holding down the Ctrl key as we drag constrains the shape to a square. Look at the resultant selection, the ‘Marching Ants’; it is the size we dragged the rectangle out to. Now set the feather to 50 pixels and do the same. This time the corners are rounded and it is a noticeably larger selection than where we dragged our mouse. The difference has been the feather setting. We’ll look at this in action on the next section. For now, press Ctrl+D to clear the selection. 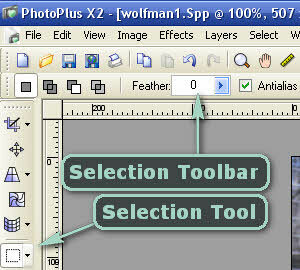 Returning to the Selection Tool, choose Ellipse from the fly-out box and set the feather to 20. Let’s turn our attention to the person layer which should still be semi-transparent. Drag an elliptical selection over the person’s face, ensuring the features are contained within the selection, then let go of the mouse button. 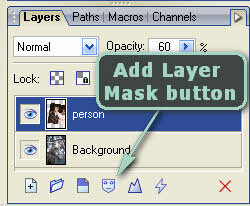 Now for the magic bit - click on the ‘Add Layer Mask’ (the mask icon button, at the bottom of the Layers Tab). Hey Presto! The background of the person layer just disappeared, leaving us with a (familiar?) face staring out at us but from a different body! 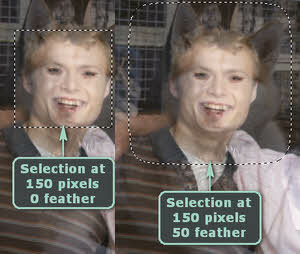 The feather of 20 pixels has allowed our face to blend into the image it is being superimposed upon, now we can adjust the opacity of the person layer to suit our needs. If the feather amount is too much or too little for the image being used, just re-trace the steps taken using the History Tab to the ‘New selection’ point. Adjust the feather settings (more or less to suit) and try adding the mask again. As stated, the purpose of the feathering is to blend the face into the background as unnoticeably as possible, however, the choice is yours. Press Ctrl+D to clear the selection (De-select). Well done, we’ve just completed a simple layer mask! Let’s save our work before continuing by pressing Ctrl+S. With our work saved, it’s an opportune time to experiment a bit with the selections. If we look closely at the person layer there is now a small thumbnail image of a black background with a small white oval, this is a picture of our mask. There should be a white line running around its outside edge. We are going to delete the mask for now, click on the red cross on the bottom right corner of the layers tab - do not worry, we can always get back to here by going to the File>Revert option in the menu bar. This restores our image to the last saved state, which is fine providing we don’t save the file between now and when we finish this experiment - unless we’re happier with the results! Try out the different selection tools - Rectangular, Ellipse, Freehand or Polygon, varying the amount of feather (0, 10, 20, and 50) and applying the mask again. Tip: As an alternative to setting the feather in the ‘Context Toolbar’ each time and creating a new selection, set the Feather to 0 and use the menu bar to adjust the feather. Go to Select>Modify>Feather to set the feather amount. To try another setting use the History Tab to step back to the ‘New selection’ state (before the Feather Selection) and set a new feather amount via the Select>Modify>Feather route. One of the many advantages with masking over other ways of creating this image is, if we look at our image a day or two later and discover a mistake, it is easy to just paint out or paint back the mask to remove the errors simply by selecting the mask and painting over it. See Simple Layer Masks 2 for more details, or deleting the mask and creating another quick shape mask rather than opening up both images and starting again. Taking a selection of other images from Serif PagePlus X2, this is another example of what can be achieved through Layer Masks. Each image is on a separate layer, each with it’s own mask and varying opacity. Interested in finding out how? Take a look at Simple Layer Masking Part Two in the ‘Basic Enjoyment’ tutorials. Remember those funny photo’s where we put our heads through a hole in a free standing frame that has a humorous painting on one side? We can do the same thing in Serif PhotoPlus simply by combining one image with another and adding a Layer Mask to it. Although these images come from the Serif Premium Image Collection 2, it is not necessary to have the same images to follow along here. All that’s needed is one image of a person and another background image to superimpose the face on to, it could be an animal, a car, a house - anything; just as long as they are both front facing views as we are keeping this simple.